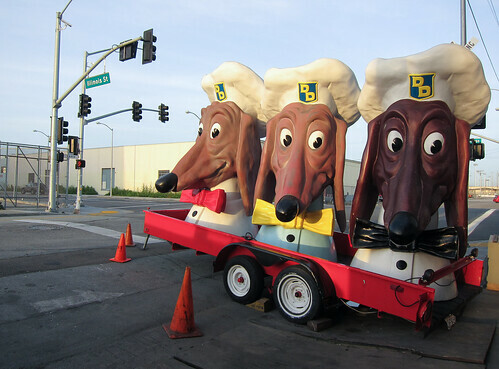 Yup, "old sckool" Doggie Diner heads in San Francisco, California. Happy St. Patrick's Day From Lucky Dog Kahuna Luna! The story of Luna's hard beginning days of life, even before his eyes were opened yet, HERE. Irish Society of Boston organized what was the first Saint Patrick's Day Parade in the colonies on 17 March 1737. The first celebration of Saint Patrick's Day in New York City was held at the Crown and Thistle Tavern in 1756, and New York's first Saint Patrick's Day Parade was held on 17 March 1762 by Irish soldiers in the British Army. In 1780, General George Washington, who commanded soldiers of Irish descent in the Continental Army, allowed his troops a holiday on 17 March “as an act of solidarity with the Irish in their fight for independence." This event became known as The St. Patrick's Day Encampment of 1780. Today, Saint Patrick's Day is widely celebrated in America by Irish and non-Irish alike. Americans celebrate the holiday by wearing green clothing. Many people, regardless of ethnic background, wear green-coloured clothing and items. Traditionally, those who are caught not wearing green are pinched. Some cities paint the traffic stripe of their parade routes green. Chicago dyes its river green and has done so since 1961 when sewer workers used green dye to check for sewer discharges and got the idea to turn the river green for St. Patrick's Day. Indianapolis also dyes its main canal green. Savannah dyes its downtown city fountains green. Missouri University of Science and Technology - St Pat's Board Alumni paint 12 city blocks kelly green with mops before the annual parade. In Jamestown, New York, the Chadakoin River (a small tributary that connects Conewango Creek with its source at Chautauqua Lake) is dyed green each year." Incredible Images Of Hero Dog Saving Mortally Wounded Dog In South America! Incredible footage of a Chilean dog saving his friend on a dangerous and busy highway in Santiago, Chile, South America. "These images seen from the surveillance cameras show a very common situation with our overpopulated highways. It is normal for us to see dogs run over. In the video, we can see this dog fighting for his life because he was run over by the vehicle. "What is very touching is to see the very heroic actions of this other dog who is trying to pull him to the side of the highway. We are going to keep seeing things like this until we find a solution to the dogs living on the streets." It seems the truth of this story has been lost in the amount of press its received, due to this it has now been unconfirmed on the dog surviving. "I read about this video on the paper yesterday and it said the dog that was ran over by the car didn't make it through. It also said that a lot of people called the highway emergency number wanting to adopt the hero dog, but it was left on a street near Costanera and never found again." NOTE: This was first and original video that was uploaded to Youtube that started the popularity for this amazing puppy. Credits go to www.liveleak.com/ for this particular video. The hero dog ran away. Video of the hero dog in English. Note - Unfortunately, the wounded dog did not survive as the English language video indicated.